1. Bandicut now supports multi-track video cutting. - The user is able to save all video tracks or a selected video track. Some video files have more than 2 video steams in one video file. 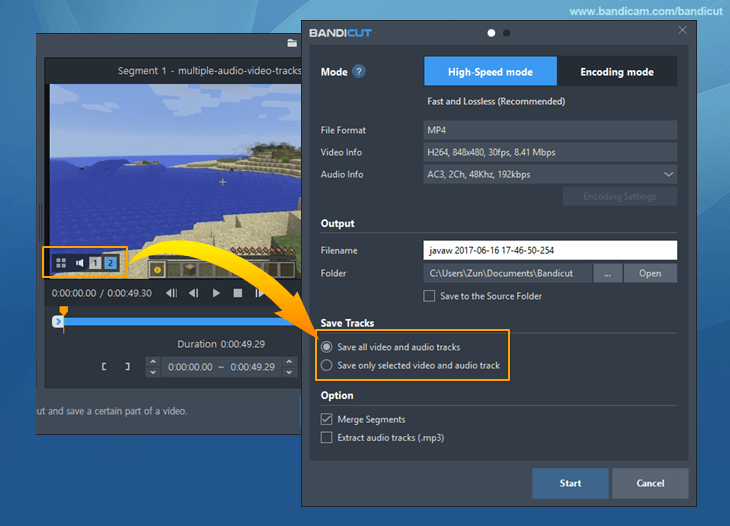 Bandicut 1.2.2 or higher version allows you to cut/save the selected video and audio track. 2. Improved the preview function when a multi-track video is added. 3. Added the Dutch, Polish, Romanian, Vietnamese language files. Many thanks to Fer, Zbigniew Strzelczyk, Matrix and Cao Việt Hùng. 4. Bug fixed - Failed to cut .flv video formats.